Look, I know that I said that the zombies were coming and they wanted snacks. But, seriously, guys, we need to be all-around good hosts to our zombies. These are just our undead brethren. Don’t be hatin’. 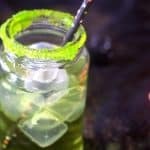 Go ahead, whip-up this kid-friendly Rotten Zombie Punch for the littlies (and a little adult Zombie Brain Float for the not so littlies) and let’s get to partying. Because, seriously, the apocalypse, I mean, Halloween is coming and it’s going to be so fun. So, I’m thinking about throwing a huge Halloween party this year. Like huge. Bigger than any I’ve thrown before. Which would mean a lot because I generally don’t throw Halloween parties at all. But my 3-nager (yes, she JUST turned three), is totally into Halloween this year and I think I need to make a big deal out of it. So, a little Rotten Zombie Punch, a little in-home decor and a special porch decoration and we’d be set. Like for real–for a 3 year old, this will be a HUGE party. LOL! My 14 year old might prefer to have a real party, though. 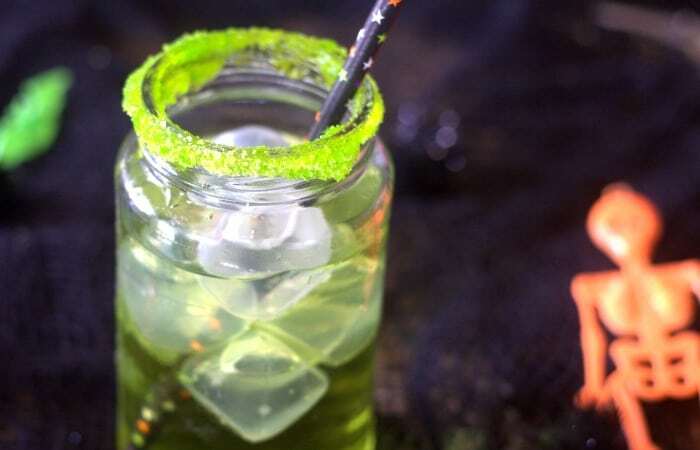 One where we all dress-up and the Rotten Zombie Punch is served in skull-cups. How do I reconcile both parties? I can’t leave my son home alone with his buddies while I take my littlies out trick-or-treating, either. OH THE CUNUNDRUM! (is that even a real word?) I really feel like this is a bind I might not be able to solve over punch. It may take something stiffer. LOL! So, while I debate, you go make some Rotten Zombie Punch. I’ll just be here, waiting, thinking. So you can find me and the recipe again, be sure to pin this, ok? Otherwise, it’ll be buried and gone on the internets. Heh. 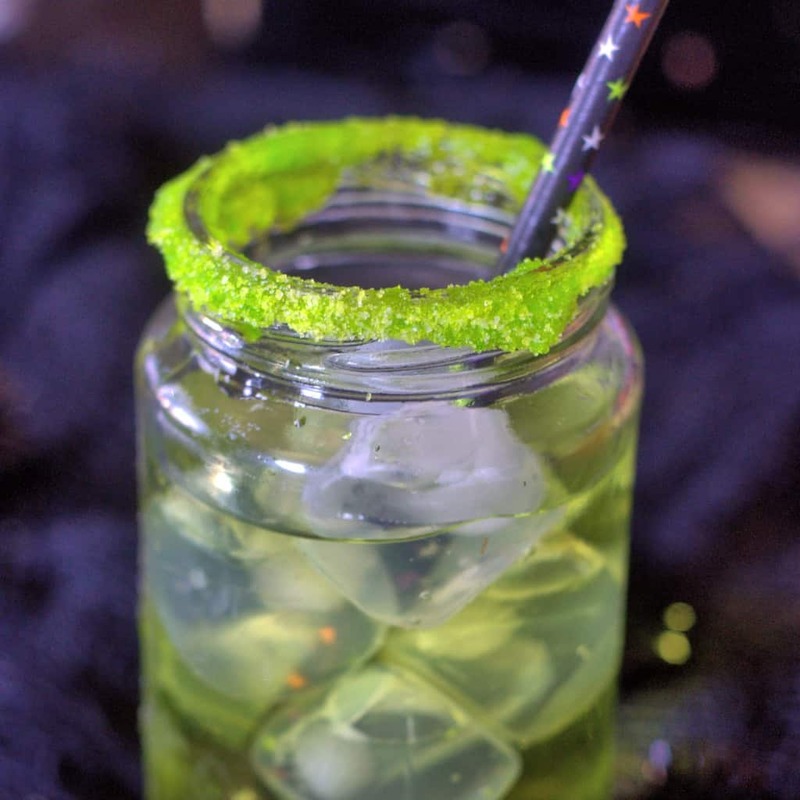 Go ahead, whip-up this kid-friendly Rotten Zombie Punch for the littlies (and a little adult Zombie Brain Float for the not so littlies). On a small plate mix sugar and food coloring. 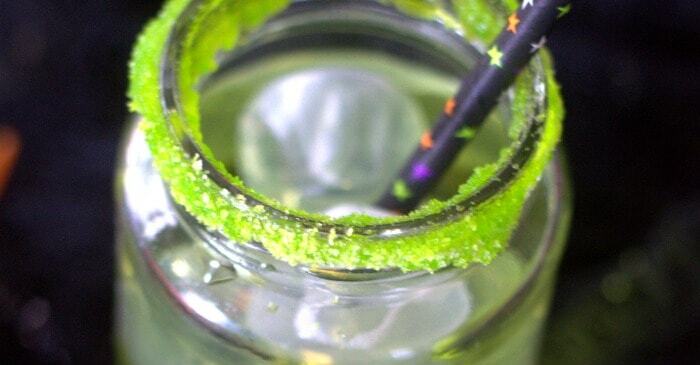 Wet the rim of the mason jar and roll in sugar. Pour in light green powerade, fruit punch and apple juice. Top off with a really cute halloween straw.